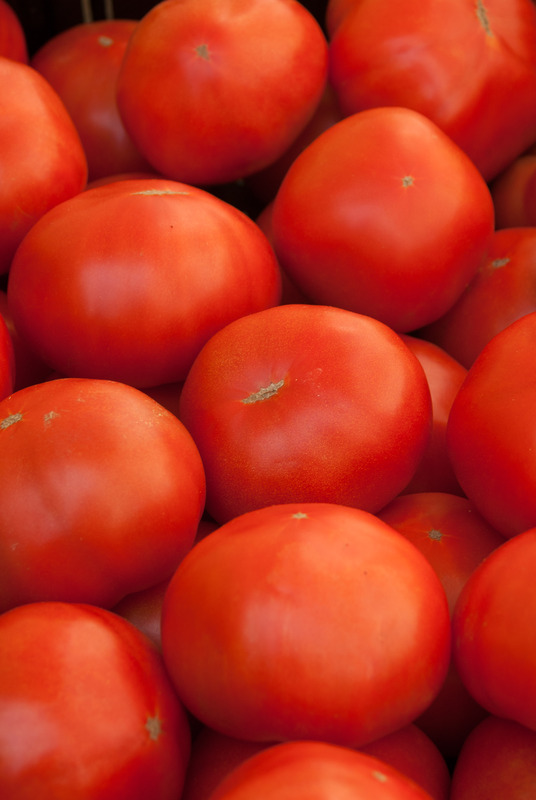 In July, farmers’ markets in mid-Atlantic states are overloaded with fresh ripe tomatoes. Ask anyone who’s eaten a store-bought tomato – they just aren’t what they used to be… It’s true, tomatoes have come a long way through selection and breeding practices — but not all their flavor has been lost – and there are efforts afoot to rescue their long lost flavor and healing capabilities! Through centuries of plant breeding tomatoes were transformed from a bitter, berry-sized fruit that grew on bushes in the deserts of western South America, to a popular sweet-tart fruit, that most people consider a vegetable (McGee, 2004, p. 329). Over the past 30 years, however, careful selection of specific traits sacrificed its unique flavor to transform the tomato into a more hardy plant, that grows uniformly round, resistant to disease and able to grow on vines that do not sprawl (Beckles, 2012; Robinson, 2013). Tomatoes found in supermarkets today are not allowed to ripen on the vine. If they were sold that way, by the time they were shipped to the supermarket they would be overripe, or on the verge of rotting. The tomato industry will pick tomatoes before they are ripe, usually when they show the first hint of color (at the breaker stage). This gives the industry up to 2 weeks to get the tomatoes to wherever they will be sold before they turn red. Ripening can also be speeded up through spraying them with ethylene gas at regional warehouses. This way consumers see red tomatoes in the market, that are not fully ripe. This is why people complain that tomatoes lack flavor these days. Because the tomato varieties most available today have less taste and nutrient content than their predecessors, agronomists are now experimenting with heirloom varieties and with breeding back in some of the chemical components of the original fruit to improve their flavor (Allen, 2008). In spite of the losses, today’s tomato still delivers a number of specific phytonutrients optimized through growing processes, selection, storage and preparation. One interesting study compared conventional and organic production of tomatoes over ten years and demonstrated statistically higher levels of the plant nutrients quercetin and kaempferol aglycones in organically grown tomatoes. Researchers saw increased levels of these nutrients in plants grown using organic methods (Mitchell, et al., 2007). Try heirloom tomatoes at your local farmers’ market. They will have much more flavor than store bought tomatoes, because they will have been allowed to ripen on the vine. Beckles, D. M. (2012). Factors affecting the postharvest soluble solids and sugar content of tomato (Solanum lycopersicum L.) fruit. Postharvest Biology and Technology 63(1), 129–140. McGee, H. (2004). On food and cooking: The science and lore of the kitchen (Revised). Scribner: New York, NY. Mitchell, A.E., Hong, Y., Koh, E., Barrett, D.M., Bryant, D.E., Denison, R.F., and Kaffka, S., (2007). Ten-year comparison of the influence of organic and conventional crop management practices on the content of flavonoids in tomatoes. Journal of Agricultural Food Chemistry 55, 6154-6159. Robinson, J. (2013). Eating on the wild side: The missing link to optimum health. Little, Brown and Company: New York, NY. 3-1/2 cup of herb leaves (basil, cilantro, anise hyssop, mint; you can also use the flowers of plants like basil, sage and rosemary. To prepare you will want to put the leaves, garlic, salt and Cheese, if you are using it in a blender and mix until you have a paste. drizzle in the oil slowly and blend until you have the consistency you desire. Note that if you use a nut like cashew, you will get a somewhat creamy result, especially if you add a tablespoon of lemon. Keep tasting your creation. If your pesto tastes a little bitter, try throwing in a little basil or nuts like almonds or cashews; any one of these ingredients will sweeten it up – without sugar. If it tastes a little too oily, you will want to throw in some more herb leaves. And if it just seems like it’s missing something a teaspoon of lemon may just be the right touch. Let yourself explore until you come up with the perfect pesto! Let me know how it goes! If you are not feeling all that adventurous, check out these recipes, and do let me knowhow it goes. If you are like me, you might eat 3 times more salads in the summer. The greens are so fresh and delicious, and the temperatures so high, that it makes total sense to cool off with a nice salad for lunch or dinner. Refrigerators across the US are filled with fresh greens at this time of year – and many refrigerator doors are adorned with several bottles of salad dressings – a flavor for every occasion. What you may not know is that lurking in that salad dressing bottle are a lot of ingredients that you might not eat if you knew what they were. That’s why I always make my own salad dressings. Oil – every salad dressing has it and may times it’s the unsavory trans fat version, which you can read about here. Besides the nasty trans fats, the most widely used oils in commercial dressings are canola oil and soy oil. They are grown far and wide across the US and Canada and therefore far less expensive than oils made of plants that don’t’ grow well here – like olive oil. If you have any concerns about eating genetically modified foods, your should know that it is extremely difficult to find canola and soy oils in North America that are not genetically modified. Your favorite store-bought brand may even be a “fat-free” dressing. Take this as a warning. When fat is taken out, water is usually added. Water is good for you and really not a bad thing to add to almost anything, but water does not absorb flavor like fat does. So without fat and flavor how are you supposed to sell salad dressing? Check the ingredients on any fat-free dressing– if there’s more water, manufacturers will have added more laboratory-manufactured flavor, which might even come in the form of added sugars and a chemical called mono sodium glutamate (MSG) which it can cause adverse reactions (especially headaches) to people who are sensitive to it. Besides the artificial flavor concern, your greens are chock full of two nutrients, lutein and beta-carotene, which support healthy eyes and normal growth processes. Did you know that your body can only take advantage of these nutrients when your greens are served with some fat? So a little bit of healthy fat actually helps the body. So what’s the solution? MAKE YOUR OWN. If you can find your way around a set of measuring spoons, and a measuring cup, and if you typically shake up your bottle of store-bought salad dressing before putting it on your fresh greens, congratulations! You have the skills it takes to make your own salad dressing. Come to the Route 1 Farmers’ Market at noon on Saturday, June 21 at noon to find out how! I will be doing a cooking demonstration. What’s in YOUR salad dressing? Summer is the time for delicious fresh greens perfect for making salads. Leafy greens like lettuces, chard, arugula and kale deliver energy straight from the sun in the form of rich nutrients our bodies love and need. If you bring home fresh greens from the farmers’ market – what ever you do – don’t reverse the positive benefits of those delicate greens by coating them with a salad dressing you threw in your cart in the grocery store – it’s full of questionable ingredients, especially ones you cannot pronounce! The oils used in most store-bought salad dressings tend to be chemically treated or partially-hydrogenated to ensure that they won’t go rancid. Making them shelf-stable is good for supermarket stock, but it’s not good for your body. Partially-hydrogenated oils are otherwise known as trans fats, the kind of fat that the FDA targeted last November with a proposal to consider revoking it’s GRAS (Generally Recognized As Safe) status. Under current law, food labels are allowed to say “zero trans fat,” if the amount of trans fat they contain is below 0.5 grams per serving. Under the FDA proposal, even this small quantity would have to be removed for these products to be sold anywhere in the US. The final decision has not yet been made so in the mean time, you can avoid trans fats, and other nasty ingredients by making your own salad dressing. Learn more this Saturday at 12pm at the Route 1 Farmer’s Market where I will be doing a cooking demonstration. It’s that time of year when farmers’ markets open up and bring fresh local vegetables and fruits within blocks of our homes! This summer I will be participating in the new Route 1 Farmers’ Market located in the Gateway Arts District, 4100 Rhode Island Avenue in Brentwood, MD. This is a new farmers’ market site for my neighborhood. It will be located at the old B & J Auto Lot, which was purchased by the Prince George’s County Redevelopment Authority and slated for development by Landex Companies. 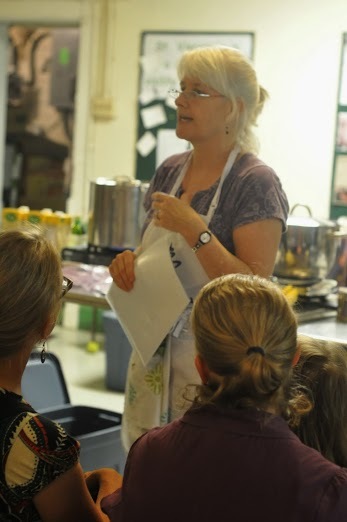 Join me on June 21 for a food demonstration and talk on the importance of eating fermented foods. I will be making up a batch of sauerkraut and sharing some easy salad recipes (since all kinds of greens are now in season). I look forward to seeing you there from 8am – 2 pm on June 21! 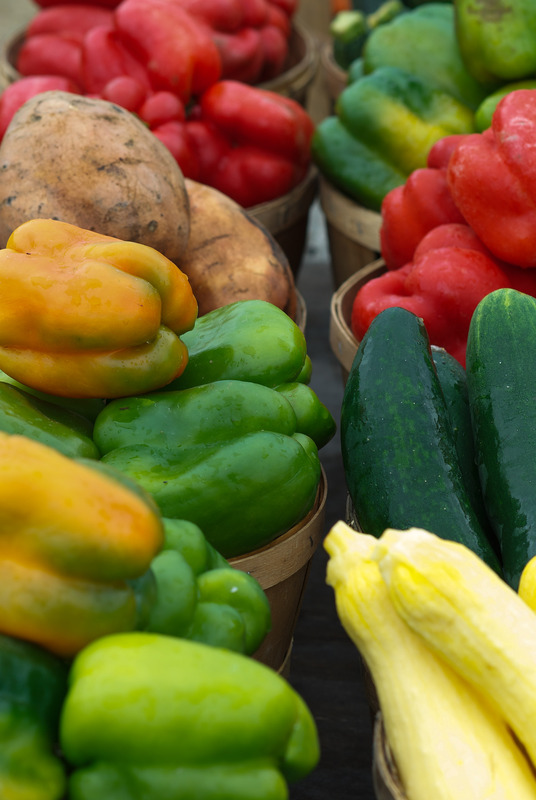 Right around now in the mid-Atlantic region community farmers’ markets are starting up and running throughout the summer. I am a huge fan of farmers’ markets – a great place to get locally grown fruits and vegetables. Stay tuned for updates – I will be doing some cooking demonstrations here in PG county and elsewhere as the summer rolls out…. This past year, I have been volunteering at Unity Health Care giving some nutrition education talks to low income families who struggle to put good food on the table. So, today I am sharing with you this announcement from the Columbia Heights Community Marketplace – one place in the area that’s working on making farmers’ markets accessible to this population. Please take a look, donate and pass it on! Just $25 dollars can DOUBLE the fruits and vegetables purchased by one low-income family for an entire month. Donate today to help families access healthy, affordable food! The Columbia Heights Farmers’ Market officially kicked off its 5th season on April 19th. Last year, the farmers market matching funds program provided over $13,000 to make it easier for low-income families to eat healthy and stretch their food budgets. It’s simple. If a customer spends $5 on fruits and vegetables at the market using Federal nutrition benefits like food stamps, we provide an additional $5. We need to raise $10,000 by May 21st to ensure that low income families can access healthy, affordable food for the entire 2014 market season. Every dollar helps, so please donate today. Many thanks for your support, and we’ll see you at the market! Looking for a way to clean up your act before summer begins? 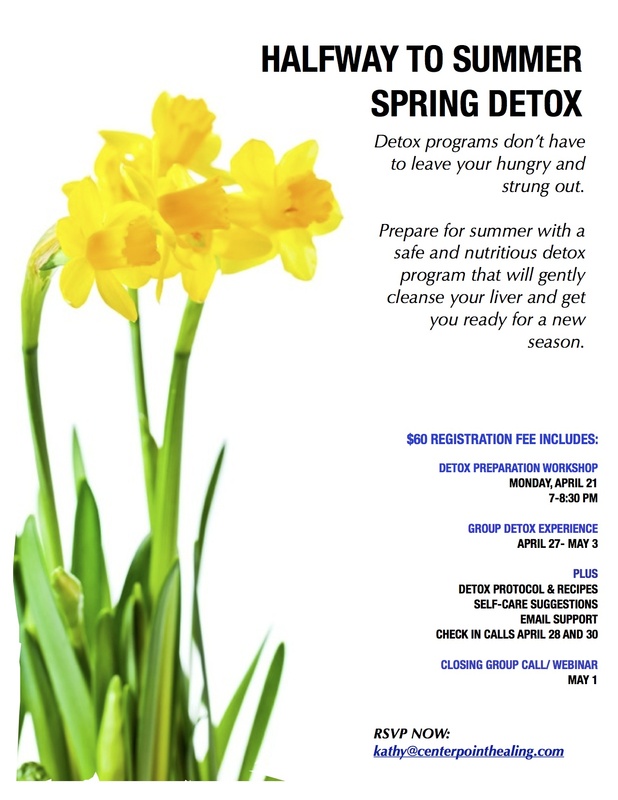 Why not join me in doing a spring detox? 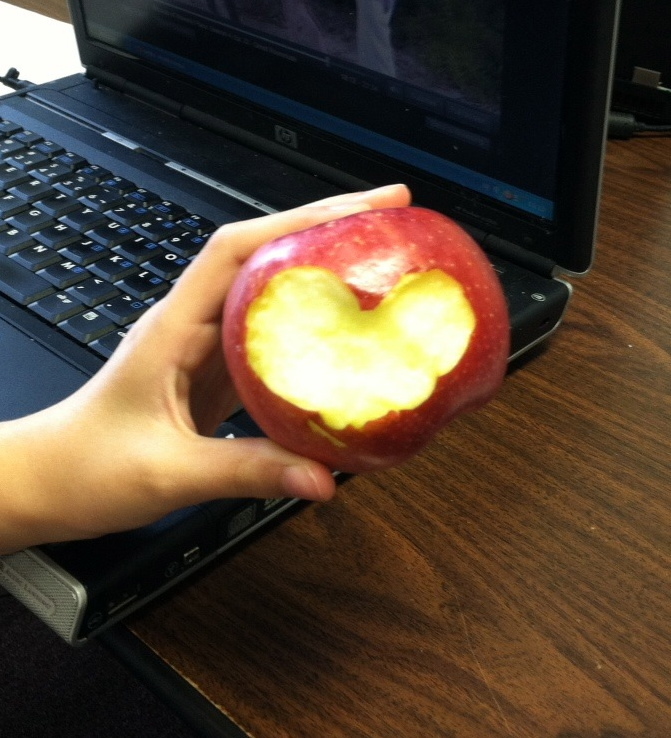 Here are some random thoughts on apples that you may not have considered…. Sometimes when a person eats fruit, they end up with a bloated stomach. This is a sign that the fruit is fermenting while it travels through the digestive system. Apples, however, contain a malic and tartaric acids which prevent them from fermenting in your stomach so they are less likely than other fruits to cause bloating. Apples are best stored in the refrigerator. Thy do better in the dark and in cooler temperatures. Like other fruits, apple skins give off ethylene gas. When storing apples in the refrigerator; keep them away from your carrots because this gas will give your carrots a bitter taste. (Robinson, 2013). Robinson, Jo (2013-06-04). Eating on the Wild Side: The Missing Link to Optimum Health (p. 229). Little, Brown and Company. Kindle Edition. Wood, R. (2010). The new whole foods encyclopedia. Penguin Group: New York., NY. Last Sunday, my classmate Josh Smith and I gave a presentation at a parish in downtown Baltimore organized by the Baltimore Food and Faith Project, supported by the Johns Hopkins University Bloomberg School of Public Health’s Center for a Livable Future. 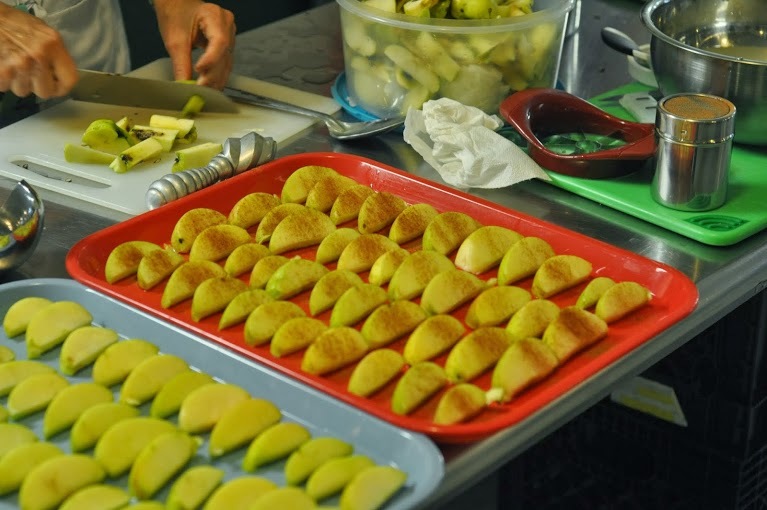 While I did mention this in my previous blog, I did want to give a shout out to the good work of the Baltimore Food and Faith project — working with faith communities, religious schools, and faith-based organizations to address social and economic justice in the food system as well as ecological care. Josh and I were welcomed by a fantastic group of people eager to learn more about how to combine making healthy food choices with more sustainable living. On the menu were 50 lbs of apples donated by the Baltimore Orchard Project, an organization dedicated to bringing productive fruit trees and fresh fruit to neighborhoods throughout Baltimore; by doing so, they are working with local neighborhoods and faith communities to create a greener and healthier city, and more resilient neighborhood communities. An integrative approach to health and nutrition which includes Earth consciousness.